The Lyon Brace (also, "el corse de Leones" as I knew it in Sevilla, Spain) was invented by Stagnara in 1950 and therefore is also known as the Stagnara brace. This brace is commonly prescribed in some European countries such as France and Spain, however it is not commonly prescribed in North America and the UK. The Lyon brace can correct the coronal plane curves and the lumbar vertebral rotation. It is a made to measure brace, which is obtained from a negative plaster cast. The positive cast is rectified by adding plaster to bony prominences as well as sensitive zones, therefore avoiding pressure over these areas as well as reducing the convexity or humps by removing plaster (Wood, 2003). 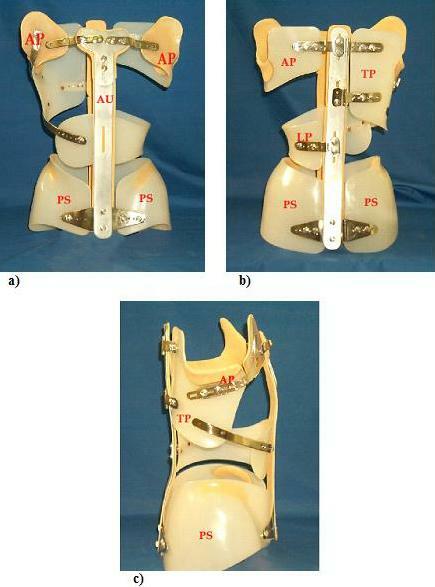 The brace is composed of a pelvic section, an axillary plate, thoracic plate and lumbar plate, which are fabricated in plastic, (figure 3.7). Originally fabricated in plexidur, however this was removed from the market due to its harmful fumes that were produced during its production. Polypropylene can be utilised in its place. These plates are connected in units by two vertical uprights of duraluminum, one anterior and the other posterior. The posterior pieces are connected to the vertical upright through hinges and the anterior pieces through screws that facilitate donning and doffing of the brace. The pelvic section is composed of two lateral valves, one for the right hemipelvis and the other for the left hemipelvis. The valves are connected by metal pieces to the vertical anterior and posterior upright. The pelvic section extends its superior trimline over the iliac crests therefore providing firm support of the brace without impinging on the crests. The pelvic section shape must allow the patient to sit without causing discomfort. The lateral inferior trimline is 15 mm above the greater trochanter therefore allowing ambulation without discomfort. The axilla support is moulded over the 4th and 5th ribs and prolongs anterior superior to obtain good subclavicular support. The thoracic plate applies pressure posteriorly to the convex side of the curve and extends laterally to the midline of the axilla. The posterior superior trimline passes above the apex of the curve and the inferior trimline extends to the inferior neutral vertebra and follows the angle of the ribs, inferiorly and anteriorly. The lumbar plate applies a derotational effect, as well as applies pressure to the apex of the lumbar curve. Occasionally an anterior prolongation from the lumbar plate extends over the abdomen to control the lumbar lordosis (Hidalgo, 1993). Progressive scoliosis with lumbar or low thoracolumbar curves between 30 to 50 degrees Cobb angle. Similar characteristics as mentioned, however with curves greater than 50 degrees Cobb angle that cannot be operated on for specific medical reasons or because the patient has not reached the skeletal maturity. After surgical treatment and once a cast brace had been applied during 3 to 6 months, the Lyon brace is applied to secure the results of the intervention. The principles of the application of the three-point pressure system are: forces at the two neutral vertebras and a counterforce at the apex of the curve. The Lyon brace also applies derotational forces to the vertebral column and therefore the main thoracic plate pushes the hump of the curve from the posterior convexity to the anterior concavity. The axilla plate, anterior upright, pelvic girdle, thoracic pad, lumbar pad, and pelvic section are represented in the figures AP, AU, PG, TP, LP, and PS. a) Anterior view of the Lyon brace. Consists of a thermoplastic left and right pelvic sections with an anterior duraluminum upright that extends vertically to the sternum. Attached to the anterior upright is an abdominal plate and positioned superiorly are left and right axilla plates. b) Posterior view of the Lyon brace. Consists of a thermoplastic left and right pelvic sections with a posterior duraluminum upright that extends vertically to the thoracic region. Attached to the posterior upright (in this case) are a left lumbar pad and a right thoracic pad. c) Lateral view of the right side of the Lyon brace. Inferiorly is the right pelvic section and superiorly is a right thoracic pad and axilla plate. This Lyon brace was, designed, hand modified and delivered to the patient by Grant Wood in Malaga, Spain, Grupo IDEO.